What Is Laser Resurfacing Treatment At The Dr Lanzer Clinic? Note the areas that are marked. The patient has heavy folds around the nasolabial area. She has a reduction in volume due to loss of fat in the cheeks. She also has heaviness in the jowl area. This is a common complaint by women. This is the patient post Liposuction to the jowls and dermal fillers to the nasolabial folds and cheeks. Note how much this has improved the condition of her skin. The heaviness in the lower face has been significantly reduced. How To Protect Your Skin Against Sunlight? Melbourne Laser Resurfacing – What To Expect From This Treatment In Australia? What Does Laser Resurfacing Cost? What Can Laser Resurfacing Do For Me? The before and after photograph seen in this page is a lady who underwent liposculpture dermal fillers of the jowls and neck followed by fillers in the cheeks, marionette lines and upper lip. There are many different options with regards to facelift procedures. Sometimes the facelift is performed surgically with a mini facelift or a deep face lift. Other times, the lift is performed with a dermal or stem cell fat transfer. There are also known surgical face lifts such as the Ulthera ultrasound device. Ultimately, the procedure that is chosen is based on a number of factors. First and foremost, the decision has to be that of the patient, whether they wish to have a full surgical procedure or if they are looking for a less invasive approach. The second factor is the actual mode and type of aging that is present. Sometimes if the aging is most related to thin skin that is drooping, in which case then it would definitely need to be a lift. In other cases, the drooping relates more to loss of a deep facial structure in which case a dermal filler or stem cell fat transfer would be more appropriate. Sometimes, the skin sags because of textural changes and in that situation, laser resurfacing would be a good choice. HOW DID LIPOSCULPTURE DERMAL FILLERS HELP THIS PATIENT? The Liposculpture Dermal Fillers improved the situation in 2 ways. First of all, part of aging is that fat collects in unwanted areas. An ideal rejuvenated face has a v-shape where there is more prominence on the cheek level coming in on an angle to a tightly well defined chin. With aging, patients develop jowls. The jowl is a combination of localised fat and also sagging of the skin. Sometimes the jowl needs to be treated with facelift surgery. In this situation, there is tightening of the muscle and removal of skin around the ear. This leads to an elevated and lifting effect of the entire face. In the present case, a facelift was not performed but rather liposculpture using the tumescent technique. By removing the fat of the jowls, the skin contracted in and this led to a more defined appearance. The same thing occurs with sagging of the neck. This is classically called the turkey neck where there is fat that collects along the neck to combine with loose, sagging skin. By removing the fat, one can induce skin retraction. Many people wonder, how it is possible to just perform Liposculpture Dermal Fillers, the removal of fat, and at the same time get a facelift effect. The reason that this happens is that once the fat is removed, there is an empty space in all the canals where the fat previously existed. These canals close, due to the compression garments. As a result, the overlying skin contracts and the clinical result is a tighter and firmer appearance. Therefore, a face lift effect can be produced by liposuction alone. In the case present, the other procedure that has been performed is a dermal filler. There are 2 types of dermal fillers. One is used on the surface to give a better contour shape. This is particularly seen around the marionette lines and the lip. One does not want to produce a very large bulging lip as this is not a cosmetically attractive appearance in Dr. Lanzer’s eyes. Rather, one tries to get more volume in the lip so that there is a convex shape with definition along the vermilion border. This border is the line between the lip and the upper lip. If it is sharp and defined then this has a youthful appearance. The second type of filler is a deep filler where the filler is placed in the cheeks under the muscle. 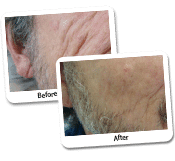 By doing this one restores the loss of volume that occurs with aging. One of the main reasons for needing facelift is a loss of structure on the face. This may be loss of muscle bone, fat and collagen. By replacing the lost tissue, with either man-made fillers or with the patient’s own fat stem cells, one can regain the convex youthful appearance and the v-shape that people associate with youthfulness. At the same time, one should always consider skin texture treatments to enhance the results of the new shape and the tighter appearance. This may be with laser resurfacing or Viva devices or aimed at improving the skin texture so that the skin appears more refreshed and clean. HOW DOES ONE ACQUIRE A FACELIFT BY A FILLER? This is actually a concept that cosmetic surgeons and dermatologist surgeons only became aware of in the last few years. For a long time, there was an emphasis on injecting Liposculpture Dermal Fillers in folds such as the nasolabial fold to improve aging. Surgeons became aware that in fact the face is a 3 dimensional structure and by increasing the volume of lost tissue, particularly in the cheeks and forehead and temporal areas, one acquires a facelift affect. WHAT HAPPENS IF ONE DOES NOT ADDRESS THE DERMAL LOSS AND CONTINUES TO PERFORM FACELIFT SURGERY? We often hear of patients who have had multiple face lifts and end up having quite an unusual appearance where the face is curved and it is pretty obvious that they have had repeated facelift surgery. Dr. Lanzer believes that this is often related to addressing just the skin but not looking at the 3 dimensional affect of putting in volume replacement as we have discussed in this article. HOW CAN ONE TELL HOW THEY ARE GOING TO LOOK AFTER A DERMAL FILLER OR FACE LIFT? There are many techniques which surgeons can help patients understand what they are going to look like. It starts by showing a patient in front of the mirror what sort of result one would expect. With a mini facelift, the results are far more predictable as there is no significant change to the deeper structures. Dr. Lanzer does offer 3-D photography with morphing which allows patients to have a better idea of how they may look. Another valuable tool is looking at photographs of other patients. Dr. Lanzer does have a large before and after gallery which he is happy to share with patients. Either way, the process should start with a free no-obligation consultation with Dr. Lanzer so that one can understand what he recommends is the best option for your facial rejuvenation.